One observation to make is this: the level of interaction seems to vary by the blogger’s level of established reputation. 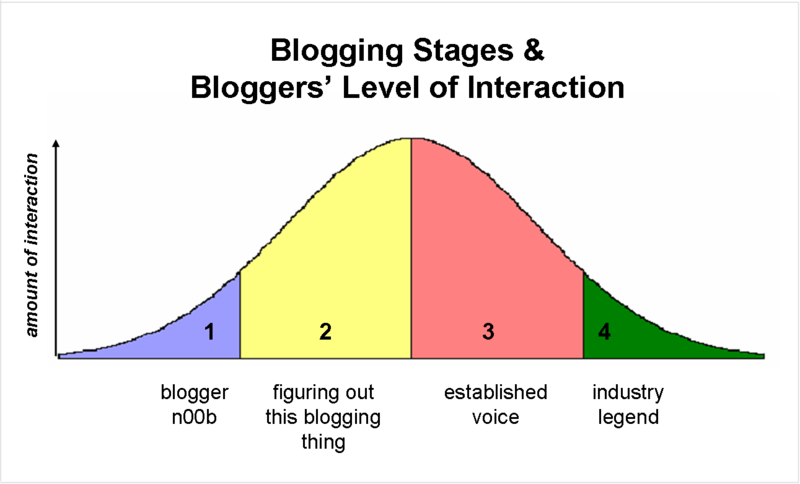 As a blogger gets more well-known on the Web, the level of interaction declines. This was my first-ever guest blog post. I’ve seen others do it. Pretty neat, ain’t it? Here are some things that occurred to me as a I wrote it. Louis’s blog is a lot bigger than mine. Per Technorati, Louis is a Top 5,000 blogger. A much bigger audience than mine. He’s a regular on Techmeme. I always want to put my best content here, but I have some coverage if a post doesn’t get much traction. People who read this blog know me, and have a sense of what I’ll write n the future. Over on Louis’s blog, there’s a much bigger audience. They’ve come to expect a certain quality. Louis’s expectations became my expectations. Louis is a Stage 3 blogger. With that, some of the crazy experimentation I like to do (such as my stick man representation of social media interactions) is not appropriate on his blog. I was cognizant of that. I picked a subject that is consistent with Louis’s overall blog. The role of bloggers, and their interactions is the kind of subject that Louis regularly covers. I wanted a post that fit his “brand”. So I didn’t write one of my Enterprise 2.0 pieces, because that’s not something he covers. I took forever to write it. Weirdly, it just took me longer to finish up this post than it usually does. Probably for the two reasons listed above.